2009 marks the end of a decade that began in 2000. This decade saw a ton of good music, and a ton of bad as well. Switchfoot managed to sneak its way into this decade, making a pretty loud splash from 2003-2005. That time frame saw them unleash a double platinum record upon the world, followed by a label-tainted gold follow-up. 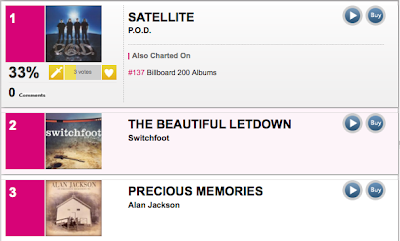 As we close this amazing decade, the noted charts tracking Billboard recognized this formerly small band from San Diego. "The Beautiful Letdown" finished at No. 195 on the Decade Billboard 200. What an accomplishment! 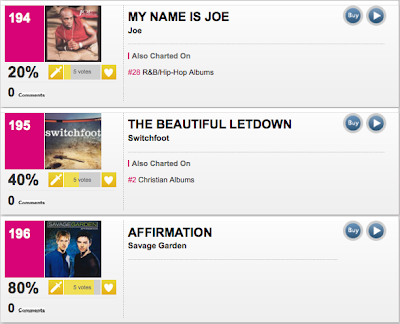 "Letdown" also charted on the Christians charts (not surprisingly) at No. 2, while "Nothing Is Sound" charted at No. 47. 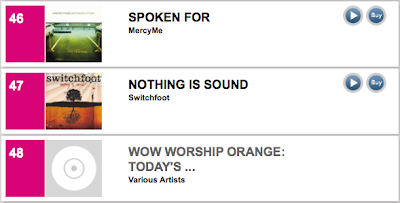 ^Congrats to Switchfoot! Here's to another great decade of music; and maybe, possibly, a BETTER one! Hello 2010. Hello Hurricane. Anyways, check out this review from the Boston Survival Guide. This is not the sort of band I would normally trumpet praises for. It’s less the “Christian rock” bit that puts me off, but rather phrases like “mainstream major label success” and “certified double platinum – 2.6 million copies sold”. There are plenty of mainstream artists I enjoy listening to – U2.. Bob Dylan.. Bruce Springsteen.. Lifehouse, even. With those artists, though, I don’t feel the need to add my voice to the chorus, as it were. But after seeing Switchfoot’s breathtaking performance at the Paradise, I’m impressed with these guys on so many levels, I can’t help myself. They could clearly fill larger venues, but they chose to play the 650-capacity Paradise, and in speaking to a few long-time fans after the show, it seems they often play more intimate clubs like this. The connection they have to their music, and to their audience, is deeply moving. As emotionally swept up I get during live concerts, it’s not often I’ll get teary, but they definitely had that effect. Another admirable trait: they’ve been major label artists, but they have an indie sensibility. Three years ago, they realized that being on Columbia Records might stifle their creativity and cause them to lose connection with their fans, so they formed lowercase people records, and got a distribution deal with Atlantic. Musically, they can be a raging sea or a calm, clear lake. Jon Forman’s lyrics are raw, honest, and life-affirming. They have a strong following in the Christian community, but they’re not “preachy”. It’s more like “we’re imperfect humans, life can be fucked up, but even if things are a mess, there’s hope”. Apart from the lone woman yelling out “JESUS!” in the middle of one of their older songs about redemption (a subject matter dealt with by many non-Christian songwriters), I wouldn’t necessarily label them as a “Christian rock band”, as their themes of desperation, soul-searching, and finding faith in one’s life are universal. I don’t know if they usually do all ages shows, but this sold out crowd ranged from teens and early 20s and even younger kids with parents, to middle aged types and older couples. Quite a diverse mix. I was pondering this and admiring the stage set, which included a backdrop of their new Hello Hurricane album and a few of those seagulls eerily in flight above the stage, as the lights went down and the band took the stage. Some guy was shining a spotlight in my direction and I briefly wondered if I might be stopped from taking photos. I noticed others looking at me, or rather just past me, and I turned to see lead singer/guitarist/songwriter Jon Foreman perched up there on the lower balcony with us as he started singing the first song on Hello Hurricane, the ethereal and hopeful “Needle and Haystack Life”. The way he sang this – a lone, emotionally vulnerable presence – gave me chills and jolted me immediately into that moment one usually strives throughout a live performance to achieve. ^It's a really really well-written review. Worth reading and keeping, so check out the rest here. "Mess of Me" continues to perform well on the charts, holding at No. 24 on the Alternative radio format. Other songs are starting to drop off as we come to the end of the year, but "Mess of Me" is still rising slowly but steadily. We still need to keep supporting it day by day, so check out our Support Section (which we update, or at least post, daily) to help out. Let's keep up the voting and requesting, guys! We're doing a great job and, as you can tell above, we are really making a difference! 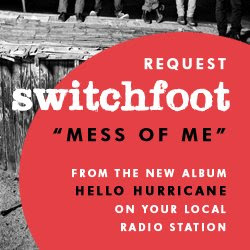 Please also go here to see a list of stations already playing "Mess of Me" and phone numbers to call in and request the song with!! - Fill-in vote "Mess of Me" in the box, after voting for one of the artists already in the countdown. - Request the song here. Scroll down, then simply press the "request" link. - RadioU's Top Ten Most Wanted. We still have the top spot! Well done! Let's keep it that way! "Mess of Me" hits RadioU's 2009 Most Wanted list! Radio Interviews; Boston photos; Radio support! DOWNLOAD Switchfoot's performance on Conan! Last Day to grab "Hello Hurricane" for only $5!